I am feeling bipolar and a bit lost these days. I have been wracking my brain trying to figure out how I am going to spend my summer vacation. (Sounds bratty right?) I am so blessed to even have a summer vacation! I wanted it to be productive and meaningful. I wanted to take my blog to a new level. I wanted to start crocheting on the side for a possible Etsy shop. I keep wrestling in my mind as if I am trying to figure out WHAT it is. Why am I so discontent lately? Why am I constantly trying find something out there to achieve? To be honest I am frustrated, I am restless, and I am puzzled. I had a vision for this blog to be an ENCOURAGEMENT to others, and quite frankly I feel as if I am the one in need of encouragement. I literally had this conversation with my husband last night, pillow talk before we shut our eyes, about how I feel like something is just missing. I want to achieve this whatever it is I can’t seem to see clearly. This desire in my heart for something that I haven’t a clue what it even is. I have been praying about this feeling for over a month now. I pray and I ask God and I try to be content on waiting…. I pray and I wait…. Today our Summer Women’s Bible study started up. YEA! I love Women’s Summer Bible Study! This year we are Studying Kelly Minster’s Nehemiah- A Heart that can break. I couldn’t help but hold back my tears, reminding myself to KEEP IT TOGETHER MAN! I am not much for public crying. To gain composer I glanced at the older women sitting at the table in front of us. They were just as filled up with encouragement at that moment as I was. I don’t want to be super old on this journey here before I really make my mind up to live for others. This life really isn’t about me. The reality is THIS LIFE ISN’T ABOUT ME! God is real and we do have a duty, a reason we are all here on Earth. We are called to be the hands and feet of Jesus, and to love others like he does while we wait for him to come back. He is coming back. That is the reality. He is coming back…that is the reality. When I put this in perspective everything else I am chasing that isn’t for him doesn’t matter. So then What God, who have you put in my heart to help? 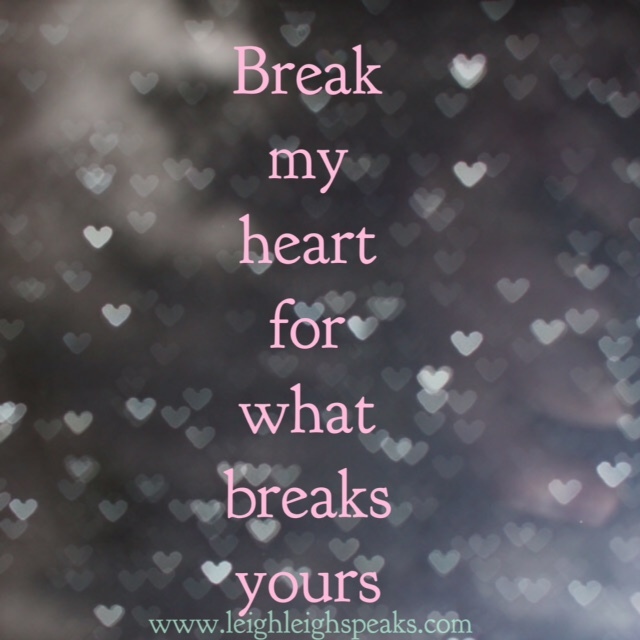 What will break my heart the way it breaks yours. I really feel vulnerable for even sharing such intimate thoughts. I usually just journal this and keep it to myself, but I can’t help but wonder if there is someone else out there that is feeling this discontentment, this arrival of something big, but you can’t put your finger it. I want to encourage you to pray and wait…pray and wait. Ask God to give you a compassionate heart for others, and then ask him to direct you to the right people to help. Keep your faith. Be patient. Now that I know for sure what it is, I will be diligently praying for revelation, compassion, and a tender heart that can break. I will also be praying for God to examine my heart and point out the cold parts so that I can warm those back up! As always I would love to hear what you have to say! Please feel free to comment! I always feel like something is missing. Maybe it is us waiting on Jesus to return ? I don’t know but just a thought. We can’t save the world but we can sure help the people that need help and love the people in our lives. I run into a lot of patients that don’t want to change their lifestyle or eating habits to be healthier so it makes me sad I cannot help them. At least you are searching what there is and what you could do. I think your right.. We are all longing for the Return of Christ! I think being a nurse is an awesome career choice you are helping others and can pray for each person you care for! All my babies are going to be in school this year.. Tear!